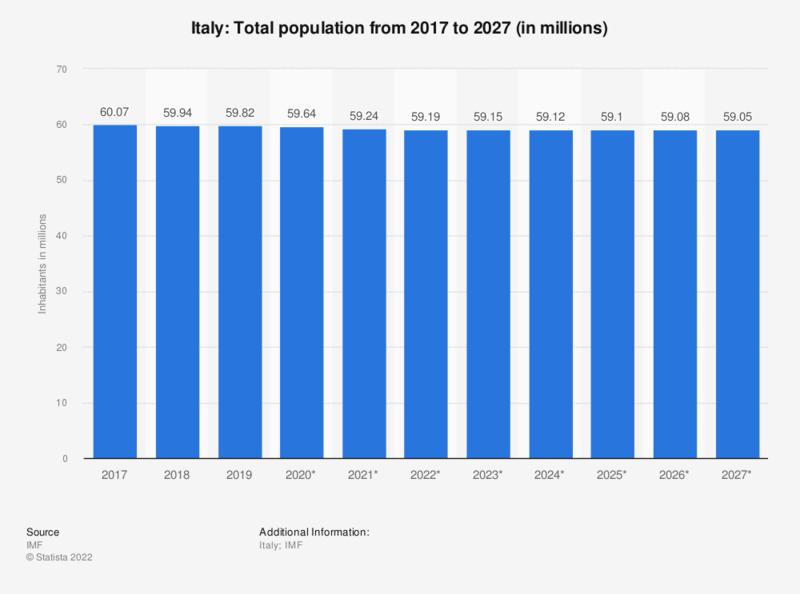 This statistic shows the total population of Italy from 2012 to 2017, with projections up until 2022. In 2017, the total population of Italy was around 60.59 million people. See Switzerland's population figures for comparison. The largest city in Italy, with the largest amount of inhabitants, is Rome, with almost 3 million inhabitants. Although the population in Italy has continuously grown year over year, population growth has significantly slowed down since 2004. It can be assumed that a decrease in population growth is related to a decrease in immigrants, especially considering that the fertility rate in the country has remained relatively stable over the past decade. A decrease in immigrants and a potential increase in emigrations could, in return, be a result of the country’s slumping economy. Many aspects of Italy’s economy have suffered as a result of the 2008 financial crisis: Italy’s unemployment rate has increased severely, most notably between 2011 and 2012 and this trend is expected to continue over the next several years. Additionally, the country’s gross domestic product (GDP) has since decreased and has struggled to maintain stability. This is most evident in Italy’s real GDP growth rate. Not only is the growth rate minimal, but Italy has also experienced several years of negative growth, especially in 2009. However, despite a struggling economy, the standard of living in Italy has remained affluent. In 2012, Italy was ranked as one of the 30 countries with the highest Human Development Index rating. The Human Development Index, also known as the HDI, is based on values of life expectancy at birth, literacy rate, education levels and gross national income per capita. Italy has one of the highest life expectancies in the world as of 2011, ranking 6th out of the top 20 countries.